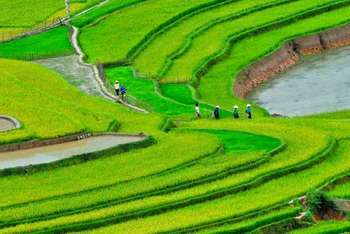 A short-term food safety consultant is needed to provide consultancy services and technical advice for a agri-business company in Vietnam. Expressions of interest must be delivered within February 15, 2018.
International Finance Corporation (IFC), a sister organization of the World Bank and member of the World Bank Group, is the largest global development institution focused on the private sector in emerging markets. They work with more than 2,000 businesses worldwide, using their capital, expertise, and influence to create markets and opportunities in the toughest areas of the world. In FY17, they delivered a record $19.3 billion in long-term financing for developing countries, leveraging the power of the private sector to help end poverty and boost shared prosperity. IFC has made agribusiness a priority because of its potential for broad development impact and especially strong role in poverty reduction. They combine investments and advisory services to help the sector address higher demand and escalating food prices in an environmentally sustainable and socially inclusive way. IFC Advisory Services supports companies that promote good agricultural practices that benefit small-scale farmers, and value chain solutions involving small and medium size enterprises. IFC is launching an advisory platform to help agribusiness companies build capacity in food safety globally. The goal of the initiative is to reduce food safety risk for IFC clients in agribusiness while contributing to industry sector capacity in select markets. Within this program, IFC will be working with agribusiness and retail clients in all food industry sectors in Vietnam on efforts to increase their competitiveness. Specifically, they will be providing advisory services that will facilitate the upgrading of food safety management systems in keeping with changing global requirements that will lead to improvement of their performance and efficiency and ultimately to sales increase, costs and risk profile reduction. In this context IFC is seeking to hire a short-term food safety consultant for 26 days from 2/2018 to 7/2018. The main objective of the assignment is to provide food safety consultancy services and technical advice for a confectionary/cake-making company in Vietnam. Eligible consultants are therefore invited to indicate their interest in providing the services within February 15, 2018.